While Myles Kennedy is toiling away at new Alter Bridge music and basking in the musical glow of his debut solo album, the singer is also coming up on a new batch of summer tour dates with a certain Guns N’ Roses guitarist. 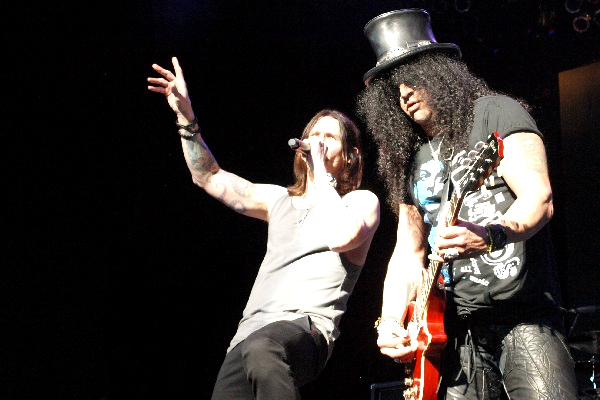 Slash and his band mates, Myles Kennedy and the Conspirators, will continue to tour in support of Slash’s latest album, “Living the Dream,” with a handful of summer North American tour dates. The trek will set off July 15 in San Francisco, California, at the Warfield Theater, and continue through an Aug. 13 date in Orlando, Florida. The tour will have the guys traveling through the U.S. and Canada, reaching all sides of the U.S. In addition to the newly-announced North American dates, Slash and Myles Kennedy and the Conspirators will keep busy on a European tour, beginning Thursday (Feb. 7) in Offenbach, Germany. They’ll also appear at several European festivals before returning to the U.S. in July. For information on the upcoming dates and ticket details, head to Slash’s official website.